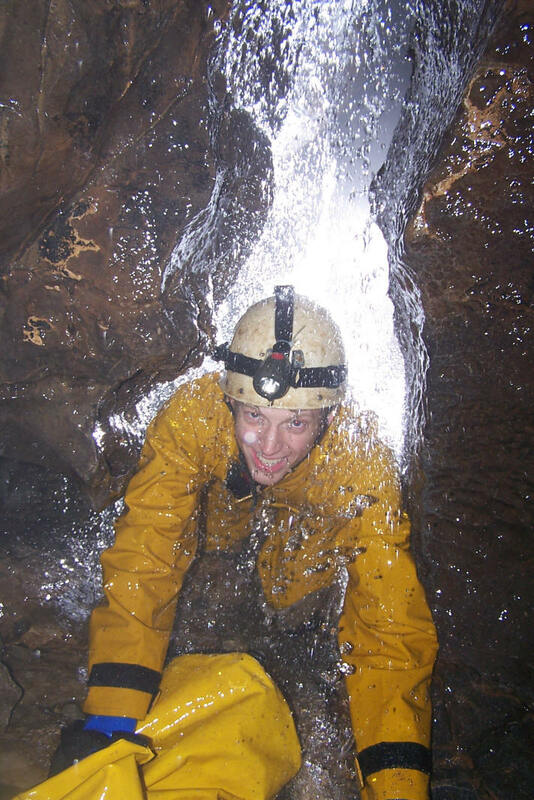 As the Derbyshire Caving Club with Derbyshire on our doorstep, we have set up this page to give browsers some idea of what Derbyshire has to offer the serious caver. Derbyshire cannot compare with the Yorkshire Dales or South Wales for their wealth of large systems but we still have some interesting caves - large and small - sporting and archaeological. Members also spend time exploring and pushing into what they hope will be unknown territory, never before seen by man! Of course, to be a caver in Derbyshire means your also a miner and vice versa. Many Derbyshire caves start in mines or connect with mine passages and sometimes it is hard to tell the two apart. Examples include Oxlow Caverns, P8, Carlswark, and so on. So if you are interested in finding out a bit more about Derbyshire caves and mines, please read on. This is not a comprehensive account but is designed to give you a taster. None of the entries here are positive recommendations or permission to visit the sites mentioned. You should use the references in the USEFUL LINKS section before attempting to visit the caves. The map below shows the Peak District (in orange) and highlights the main caving areas. The limestone covers most of the Peak District east of Buxton and south of Castleton so this is where the caves are found. The grey lines on the map are county boundaries so a number of westernmost caves are in Staffordshire in the rather blank area between Leek and the A515. The main caves here either lie along the south side of Rushup Edge (Gautries, P8, Oxlow, Giants, Winnats Head) or are in the valley near Castleton (Speedwell, Peak Cavern). P8 is a popular option for novices as it is not too long but has a bit of everything. Access is easy too, you just have to call at the farm and pay a small fee but for this you will get a few hours of sporting caving with streamways, pitches, crawls, sumps, climbs, mud, and so on. Giants Hole is a classic Derbyshire cave - big brother of P8. The original sumped entrance is now a walk in route but you have pitches, the long Crab Walk, more pitches, canals, waterfalls, climbs, and a dry(ish) way back to the streamway for the return trip. 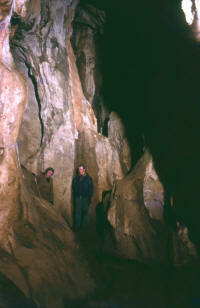 Peak Cavern is a show cave but cavers can go beyond the tourist area into the extensive passages of Peak Cavern. There are river passages, climbs, crawls, sumps and more. By diving the Far Sump, you can get to Titan. Caves are found on both sides of Eyam and Middleton Dales. None of the caves are massive but a few days pottering can be enjoyed in the area. Unfortunately, Stoney Middleton is a hotspot for car thieves but otherwise it is well worth a visit. Carlswark Cavern is a classic trip in Stoney Middleton with several entrances, muddy crawls and a reasonable sized main passage . Parts of the cave have been mined and at least two entrances were made by the miners. Merlin's Mine is close to Carlswark and also warrants a visit. It is nearly 30 m deep and has 1 km of passage. 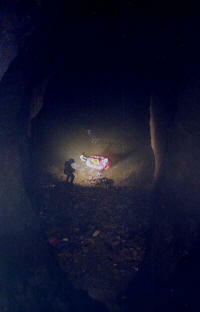 Matlock has caves and mines although the latter are usually larger and more extensive. Because of the way the ore was mined, the mines are often more like caves anyway. Wapping/Cumberland Mines are popular as they link but unfortunately access is often prevented because they are so close to a built-up area. Cumberland Cavern was a show cave once and leads into natural chambers. Jug Holes is a popular venue with an upper cavern entrance and a lower adit exit. There are no big systems accessible in the Dove Dale and Manifold valleys but much of the water in the area finds its way underground to Ilam Risings. However, there are some sporting scrambles in the cliffs surrounding the valleys. Thors Cave overlooking the river Manifold is not long but can offer an easy caving trip. Helmets optional (see photo)! As with a number of caves in the area, it has been dug archaeologically in the past. Reynard's Cave is typical of the small truncated caves surrounding the Dove. These can be reached from the river pathway. Robin's Shaft Mine is on the plateau above the Dove and represents an altogether different experience with a 90 m deep inclined shaft leading to mined an natural passage. There is more about Robin's Shaft HERE as the DCC was responsible for re-opening the mine in the early 1980s. 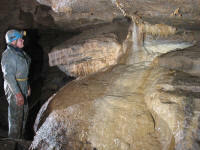 Although there are not many caves at Buxton, there is a major system which the cavers have yet to enter connecting the sinks on Stanley Moor with the risings in the Wye valley. Poole's Cavern forms part of the abandoned section of this cave system. Plunge Hole on Stanley Moor is typical of the rather meagre caves in this area which probably does not deserve more than a day for a visit. However, if you want to understand the drainage at Buxton, Stanley Moor is as good a place to start as any. Wye Head resurgence is in the middle of a residential district of Buxton and is the source of most of the water in the river Wye which flows through the town and on down to Matlock. The most useful book on caving the Peak District is "Caves of the Peak District" (ISBN 1855680343) which is currently in revision. There are historical books such as E A Baker's "Moors Caves and Crags" and Porteus' "Caves and Caverns of Peakland". There are many archaeological accounts including Don Bramwell's "Archaeology in the Peak District" (ISBN 0903485117) and articles in journals such as PDMH's. For a general account of the origin of caves in Derbyshire, the definitive text is "Limestone & Caves of the Peak District" (ISBN 0860940041) edited by Trevor Ford. 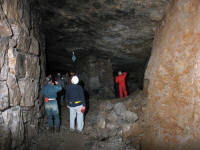 Other information sources include journals of the DCC, Eldon Pothole Club, Orpheus Caving Club and Pegasus Caving Club.